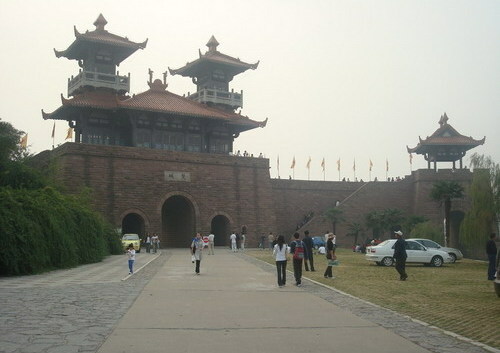 It is the biggest scenery tourist attraction in Wuhan. 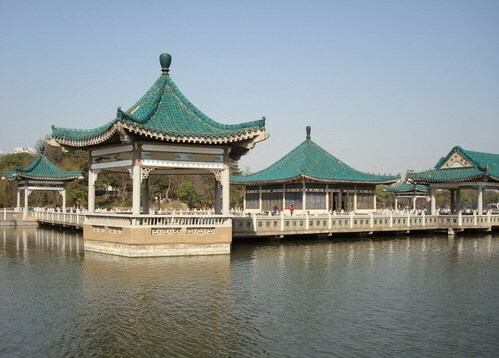 East Lake is located on the south bank of the Yangtze River and in the east suburb of Wuchang, Wuhan city. 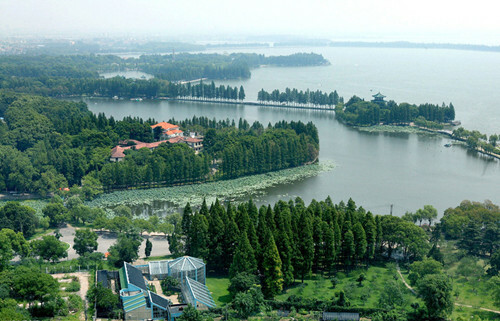 It is the biggest scenery tourist attraction in Wuhan and also the largest lake within a city in China. The lake covers an area of 87 square kilometers (33 square kilometers of water area), that is five times greater than the area of the West Lake in Hangzhou. Because of its winding banks and crisscrossing ponds and brooks, it is called 'a lake with 99 bays'. The East Lake scenic area was formed from many famous scenic spots along the bank. The six major ones are: Tingtao (Listening to Surging Waves), Mo Hill (Millstone Hill), Luoyan (Diving Wild Goose), Baima (White Horse), Chuidi (Playing Flutes), and Luohong Hills. 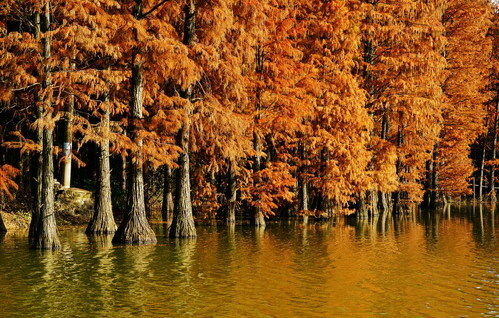 The gate of East Lake opens to the Tingtao scenic area, featuring the rare sequoia especially elegant in late autumn. The Listening-to-the-Waves Tower (Tingtao Xuan), with its classic elegance, is one of the famous buildings in this area, along with Land of Water and Cloud (Shuiyun Xiang), which serves as a teahouse, and the Tingtao Inn of Wine, a restaurant offering local fish dishes. On the north, the center of this area, is the Poetry-Reciting Pavilion (Xingyinge), built for memorizing works of Qu Yuan, the great patriotic poet of the State of Chu (one of the seven warring states before Qin (221–206 BC) in China's first feudal dynasty). Many exhibits about Qu Yuan are featured in this building including his great literary masterpieces. In addition, the first allegory sculpture park in China is here displaying wonderful sculpture and allegories. Characterized by beautiful landscape, abundant plants, the customs of the State of Chu and unique gardens, the Mo Hill scenic area attracts many tourists. In this area, the Chu cultural theme park displays the Chu culture in China. The East Lake possesses rich botanical resources. There is a large stretch of metasequoia forest. Many people come here to enjoy orchid in spring, water lily in summer, sweet osmanthus in autumn and plum blossom in winter. The Botanical Viewing Garden where more than 360 kinds of plants are nursed in 13 special gardens with flowers blooming all the year round - orchids and cherry blossoms in spring, lotus in summer, osmanthus in autumn, and plum blossoms in winter - is also admirable. Two of the most famous are the Cherry Blossom Garden, said to be one of the world's three cherry blossom capitals along with Hirosaki in Japan and Washington in America, and the Plum Blossom Garden, which is listed as the top plum garden. The East Lake possesses rich botanical resources. 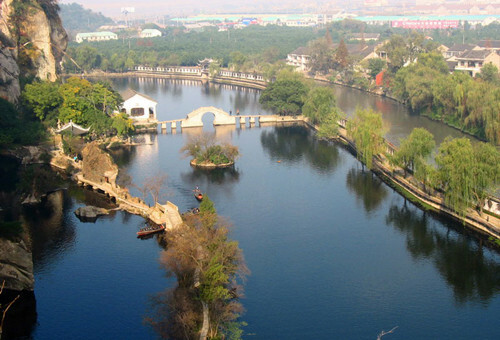 Besides these, the Bird Forest with 200 kinds of birds, the mysterious East Lake Ocean Park, the biggest sand beach bathing area in inner China, the Friendship Forest where many other cities' delegates together with Wuhan people have planted trees symbolizing friendship are all worth a visit. Admission: the Tingtao Scenic Area is free now, Moshan Chu Town needs 60 yuan, Luoyan Scenic Area needs 10 yuan, Ma’anshan Forest Sanctuary needs 10 yuan. How to get there: Bus No.14, 36, 401, 402, 411, 413, 605, 701, 712, 578, 537 to get off at the scenic area.